The American Express Business Lounge provides American Express customers with a productive retreat while attending events at the Javits Center. Whether you need somewhere quiet to meet, a break from the trade show floor, Wi-Fi, or coffee and snacks, American Express is there to support you. You can find the American Express Business Lounge on the 4E Terrace, above the south side of the Crystal Palace Lobby. 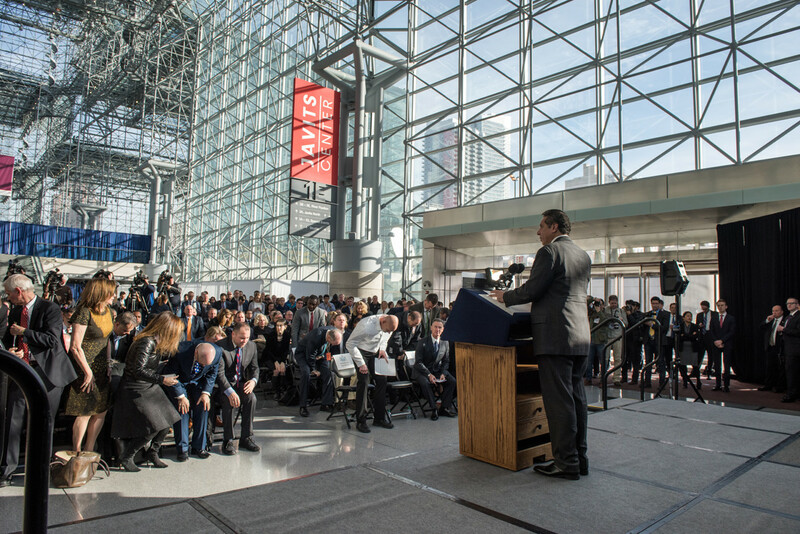 Centerplate - the leading hospitality partner to North America's premier convention centers – is the exclusive hospitality partner at the Javits Center. Each year, our award-winning culinary team and sales professionals design best-in-class food and beverage experiences for more than two million visitors, meeting planners/exhibitors for trade shows, conventions and special events, as well as nearly 40,000 exhibiting companies from around the world. We offer full-service event planning and catering and provide you with exquisite menu items, created by our award-winning chefs. We take pride in being your valued partner and will work tirelessly to make your event a success. Chase Bank has ATMs throughout the Javits Center while serving nearly half of U.S. households with a broad range of products. Make purchases with your debit card, and bank from almost anywhere with your phone, tablet or computer and at our 16,000 Chase ATMs and 5,100 branches nationwide. Chase online lets you manage your Chase accounts, view statements, monitor activity, pay bills or transfer funds securely from one central place. The FedEx Office® Print & Ship Center at the Javits Center offers you virtually everything you need to meet your convention exhibiting needs — from packing and shipping to signage, copying and last-minute office supplies. The Print & Ship Center is located on Level 2 across from the original Starbucks location. Hudson Group, a Dufry Company and one of the largest travel retailers in North America, has full-service convenience stores on Level 2 and Level 3 at the Javits Center. The company is anchored by its iconic Hudson, Hudson News and Hudson Bookseller brands and operates over 1,000 duty-paid and duty-free stores in 88 locations, including airports, commuter terminals and hotels. Our wide range of store concepts include travel essentials and convenience stores, bookstores, duty-free shops, branded specialty stores, electronics stores, and quick-service food and beverage outlets. NY Waterway operates the largest privately-owned commuter ferry service in the U.S., with service directly across from the Javits Center on Manhattan’s West Side. Carrying more than 32,000 passenger trips per day – 10 million trips per year – on 34 boats serving 23 routes between New Jersey and Manhattan, and between Rockland and Westchester counties, and between Orange and Dutchess counties, the ferries provide comfortable seating in climate-controlled cabins. A fleet of 70 NY Waterway buses provide a free, seamless commute between ferry terminals in New York and New Jersey and inland locations. SuperShuttle is the leading airport shuttle service in the US, serving over 80 airports globally, including all major New York airports such as JFK, LGA, EWR, and ISP. Whether traveling solo, attending a convention, or taking a family vacation, SuperShuttle has a variety of transportation solutions including shared-ride shuttles, exclusive non-stop shuttles, black car service, and black Sprinter and Bus service with our sister company Golden Touch Transportation. Rides can be booked online, by phone, on the SuperShuttle mobile app or by visiting our desk located on Level 2 near the original Starbucks location. The Taste NY Bistro offers our visitors fresh, locally sourced food and drinks from the Empire State. Housed on Level 2 next to the original Starbucks location, this café-style location provides homemade and homegrown produce and baked goods, as well as New York wines, beers, and ciders. From printing services to the nearest hotel, the Javits Guide lets you select from an exceptional list of vendors for any of your business needs.